There’s a deep connection between regular chiropractic care and yoga. For one, both improve your posture, flexibility, and range of motion. “Chiropractic aims to enhance neurological function by improving the functional relationships of the spine and related structures. Once functional relationships (subluxations) are improved, yoga helps to strengthen the supporting muscles through a series of poses (called ‘asanas’), designed to improve posture and strength” according to an article on the American Chiropractic Association (ACA) website. Indeed, chiropractic care is a safe, non-invasive and effective alternative pain management technique and chiropractic adjustments are designed to be gentle and realign your body to alleviate pain and eliminate the underlying causes of conditions ranging from joint pain to ear infections, sans medication, and surgery. Meanwhile, although massage therapy, weight training, and exercise are great ways to enhance the chiropractic care you receive. Yoga is by far the ideal complement to a chiropractic regimen because it’s a calm, gentle form of exercise that strengthens your body and the muscles surrounding the joints and muscles being adjusted. Experts agree yoga poses like these and others help maintain the progress chiropractic patients achieve with each visit. They also agree on yoga and chiropractic work together for wellness and help patients on a path to better overall health that they might not have been able to reach otherwise. Experts also say yoga is a great way to relieve daily stress and anxiety and stave off depression. We can relieve stress when “we learn ways to not only cope with the stress but [instead] change our attitude toward it and make changes to keep it at bay. Many find that a regular yoga practice can be of benefit in the process,” according to an article about yoga as a stress reliever on the ACA website. In the same article, ACA recommends that when seeking and selecting a yoga teacher or class you make sure it matches your personality and approach to handling stress. Among the types of yoga, the article suggestions include; yin yoga (focuses on holding poses for a longer period of time); restorative yoga (typically uses props to ensure comfort, relaxation, and release); and yang yoga (moves more quickly through poses and is better as a release for excess energy). 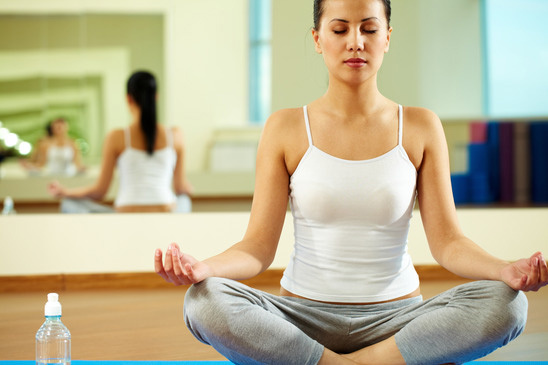 To find out more about the wellness connection between yoga and chiropractic care and learn how you can benefit from both to help with pain management, give About Dr. Todd Goldman in Medford a call at (631) 215-3825 or fill out our contact form.